Above: BWI Thurgood Marshall Airport concession workers and supporters picket in Annapolis. Calling for state action to improve their pay under a contract with their private, for-profit employer, about 300 BWI Thurgood Marshall Airport concession workers and their supporters today protested in Annapolis – with 14 of them arrested as part of a planned civil disobedience. “For over a year, my co-workers at the airport and I have been sharing our stories with elected officials here in Annapolis,” said Evelyne Diadhiou, a server at BWI’s Silver Diner. “We’ve made it clear that many of us are unable to provide for ourselves or our families because of insufficient wages and we’ve asked for the state to take action,” Diadhiou said in a release by the union supporting the workers, Unite Here Local 7. 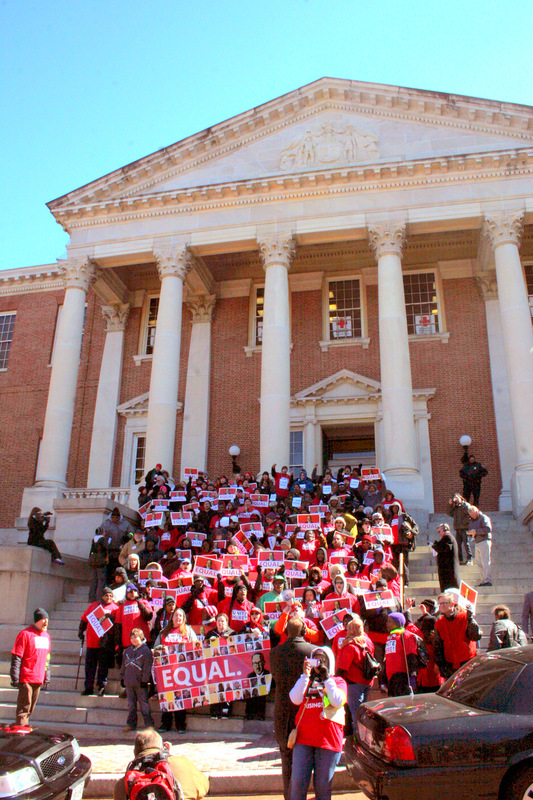 The workers, who have all been released, were handcuffed and arrested on the State House steps by Annapolis city police who charged them with “obstruction of the public way,” according to Meghan Cohorst, of Unite Here. 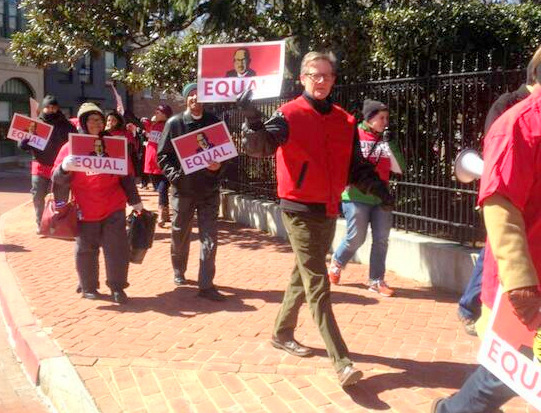 They had marched from Asbury United Methodist Church to the State House and assembled at Lawyer’s Mall, Cohorst said. The action, stepping up the pressure on Maryland officials, also comes as the workers scale down their demands, backing off of their request that state officials make up the difference between their pay from AirMall USA and the lowest paid state employees at the airport. Now, Cohorst said, the bills pending in both houses of the legislature have been amended to only ask the Maryland Aviation Administration to exercise its 2017 opt-out clause and drop AirMall. The union has led an effort to call attention to low pay and difficult working conditions for the approximately 800 food and retail workers at the airport who are employed by the company. AirMall has maintained that pay is adequate and workers are treated with respect. Workers say their situation has worsened since the AirMall took over airport concessions through a contract hammered out during the Ehrlich administration. Unite Here says it recently surveyed non-tipped concession workers at BWI and found a median wage of $8.50 per hour – about the same result they got from a 2011 survey.